Rita Dee is in Our State Magazine! One of the joys of having our alpaca farm is all the great folks we get to meet. No exception to this was the wonderful visit we recently had with writer, novelist and regular contributor to Our State magazine; Drew Perry. 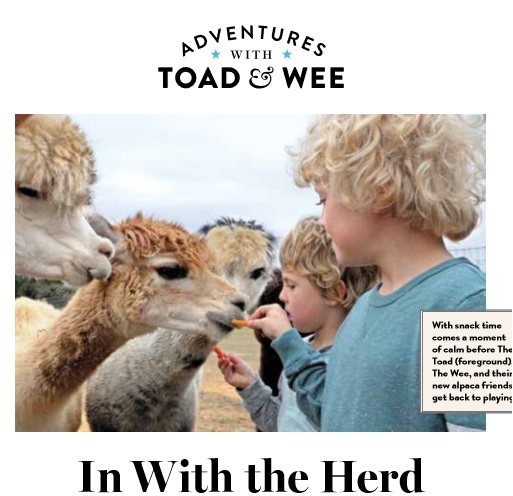 He brought along his two boys and did a great job of documenting their visit and their introduction to these wonderful animals for the magazine . The boys were enthralled, the alpacas couldn’t have been happier and of course we were more than grateful for the visit. Thanks to Our State magazine for introducing our farm and our extended alpaca family with the great state of North Carolina. We hope you will browse through all of our posts and articles on our site to learn more about these tremendous animals and the fabulous qualities of alpaca products and fashion. Thanks for visiting our digital home and feel free to contact us through the contact information below to learn more or to arrange your own visit!